I've just been doing my first rig that has lots of bones constraint by the same transform constraint, and found something I hadn't realized: the order in which you select the bones to be constrained matters (makes sense now that I think about it, for the same reason order of constraints matters). However I was disappointed to find that you only seem to be able to change this order by starting from scratch and re-selecting each constrained bone in the order you want. Since Spine already has the nice pop-up vertical list of constrained bones when you click on the abbreviated horizontal list, why not just let users drag to reorder in that menu? This would be somewhat similar to how you can change the draw order of bones that are bound to a mesh. Also one more improvement for selecting which bones are constrained: after clicking the little 'pencil' 'edit' icon to initiate choosing bones, holding shift could add new bones instead of starting from an empty list. Or instead you could hold shift as you click the 'pencil' 'edit' icon. Edit: ah works for a path constraint, but not a transform constraint. It was explicit set to not allow reordering, but I can't remember why. I think we can enable it. It's a good idea to allow bones to be added without clearing the list. We are very wary of using modifiers consistently (in fact we try not to use them at all, since they are not easily discoverable they are limited to convenience). shift and alt are generally for alternative behavior. ctrl is usually about adding to an existing selection, so I think ctrl + click would be OK. Here's a secret: right click a bone in the list to go to that bone. Also works when the select box is not open! Yeah it'd be handy if reordering got turned on for transform constraints. 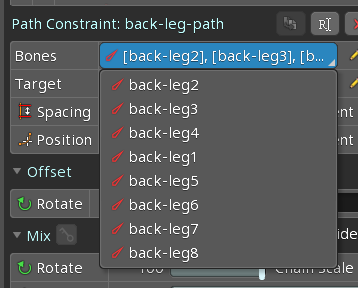 Good to know it already works for path constraints though. I guess ctrl + click would be more consistent, sounds good.